"Flops are a part of life's menu and I've never been a girl to miss out on any of the courses." A menu is a presentation of food and beverage offerings. A menu may be a la carte - which guests use to choose from a list of options - or table d'hôte, in which case a pre-established sequence of courses is served. Most people, if confronted with the word "menu", will immediately think of a menu in a restaurant. Even though the menu of a restaurant and the menu of a computer program have at first glance nothing in common, we can see that yet the have a lot in common. In a restaurant, a menu is a presentation of all their food and beverage offerings, while in a computer application it presents all the commands and functions of the application, which are available to the user via the grafical user interface. < The choices offered by a menu may be selected by a user in various ways, e.g. typing a keys or a combination of keys on a keyboard, clicking mouse buttons, or touching the display screen with the fingers. Menus in GUIs are presented with a combination of text and symbols to represent the choices. Selecting with the mouse (or finger on touch screens) on one of the symbols or text, an action will be started. Such an action or operation can, for example, be the opening or saving of a file, or the quitting or exiting of an application. A context menu is a menu in which the choices presented to the user are modified according to the current context in which the user is located. We introduce in this chapter of our Python Tkinter tutorial the pull-down menus of Tkinter, i.e. 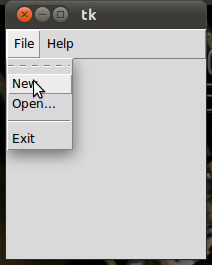 the lists at the top of the windows, which appear (or pull down), if you click on an item like, for example "File", "Edit" or "Help". The following Python script creates a simple application window with menus.